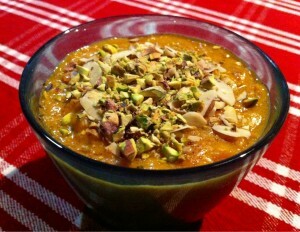 If you love the Indian dessert dish carrot halwa, but have been missing it to avoid dairy, then try this recipe. It is delicious! Cover and cook/steam for 5-7 minutes. Add the coconut milk and cinnamon. Cook on very low for 1 hour stirring occasionally. Stir more frequently towards the end as coconut milk is absorbed, so that the mixture doesn’t burn on the bottom. After the hour is up, add the honey, mix well, and cook for about 2 minutes until the honey has dissolved and all the coconut milk has been absorbed. Add the coconut manna, mix well, and simmer for 2 minutes. Add the crushed cardamom and mix well. Remove from heat and arrange in a serving dish or individual bowls. Serve hot, room temperature, or chill and serve cold.